I hear it privately all the time. Pro-Europeans are increasingly concerned about the slow progress of the official pro-EU referendum campaign called, ‘Stronger in Europe’. Now a leading pro-European campaigner has made those concerns public with a stinging criticism published yesterday by the Daily Telegraph. 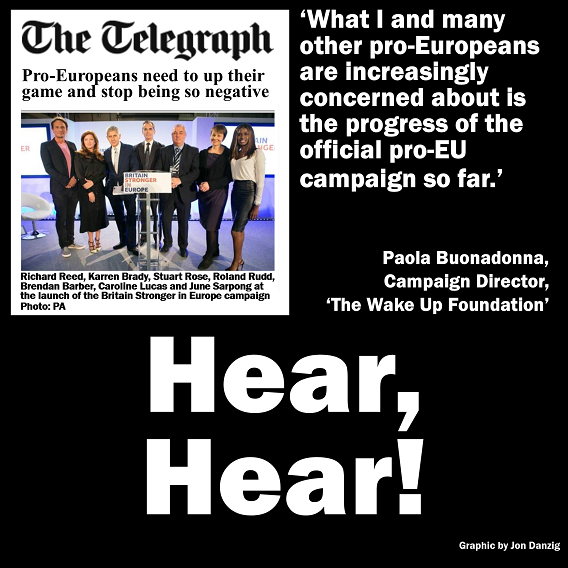 “What I and many other pro-Europeans are increasingly concerned about is the progress of the official pro-EU campaign so far,” wrote Ms Buonadonna, who was previously Campaign Director of the pro-EU campaign, British Influence. And her criticism of the ‘Stronger in Europe’ official campaign doesn’t mince words or hide behind diplomatic language. “Stronger In (Europe) seems predominantly business-focused and relentlessly negative,” she wrote. “Their website contains a minimal amount of information on how the EU works, how it works for Britain, how membership actually enhances our lives and on how, in turn, the EU has been shaped by the UK. I wholeheartedly agree. At this stage, with a referendum likely within six months, the pro-EU campaign should be well ahead of the game. After all, there is a powerful, compelling message to be told about the huge advantages of Britain’s continued membership of the EU, all backed-up with robust and sound evidence. Furthermore, there’s an equally compelling message to be told about the huge risk of uncertainty that Britain leaving the EU would create. The status of millions of British citizens living across the rest of the EU, and millions of citizens from the rest of the EU living in Britain, would be thrown into confusion upon Brexit. No member-state has ever before left the European Union, and nobody in advance of the referendum can state for sure what would be the outcome of a LEAVE victory. So far, the official pro-EU campaign seems distant, aloof, arrogant and lacking in panache and sparkle. Is there time to turn this around? I simply don’t know. Opinion polls are currently showing the electorate inching towards the EU exit door. The Prime Minister has indicated that the EU referendum will be held in the summer. That’s not much time to wake-up. And for sure, the official pro-EU campaign needs to wake-up: because if they can’t get their act together, voters may end up deciding on whether Britain should ‘LEAVE’ or ‘REMAIN’ in the EU without the benefit of a prominent, powerful and persuasive pro-EU campaign. Does the Prime Minister know what he's doing?